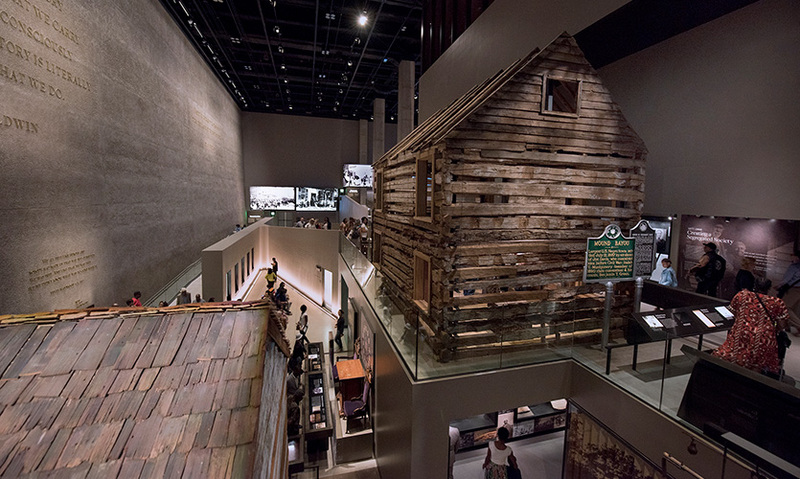 Point of Plains slave cabin in "Slavery and Freedom"
Stories of individual people reveal the lived experience of African Americans, and our collective humanity. The response has been enormous and visitation numbers have exceeded projections. 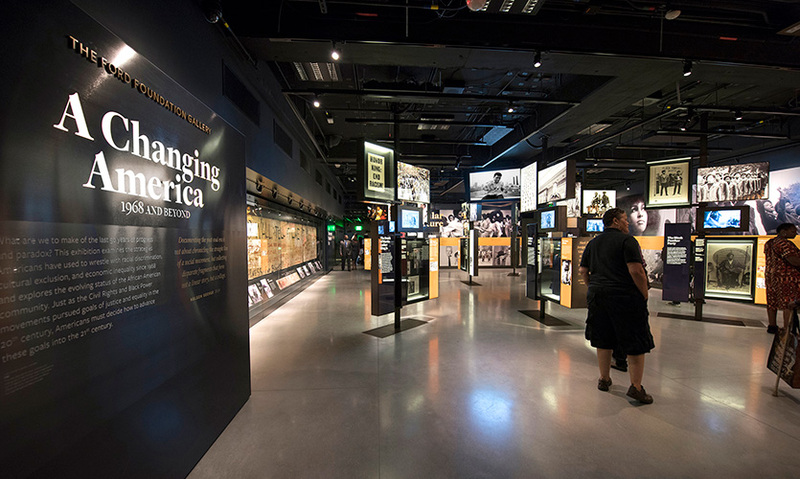 The 85,000 square feet of inaugural exhibitions for the National Museum of African American History and Culture tells a 400-year story of African American history and culture as central to America’s history. Twelve galleries take visitors on a journey that is rooted in history, embraces community, and celebrates culture. Each one of 12 inaugural exhibition galleries was designed to be unique, yet of a family of galleries that have thematic connections, design relationships and experiential balance. Visitors encounter a range of experiences and emotions brought on by the presentation of difficult content and sensitive material to the most exhilarating moments of achievement and pride. The project has the power to transform the way in which we understand our collective history, begin a national dialogue, and start to heal what has been wrought by America’s legacy of slavery, violence, and racism. Throughout the exhibitions, stories of individual people reveal the lived experience of African Americans, and our collective humanity. Creating the large volume of space allowed for the strategic placement and dramatic mounting of large-scale and iconic artifacts including a segregated railcar, a plane flown by Tuskegee airmen, a guard tower from Angola State Prison, a slave cabin from Edisto Island, and the casket in which Emmett Till was buried. 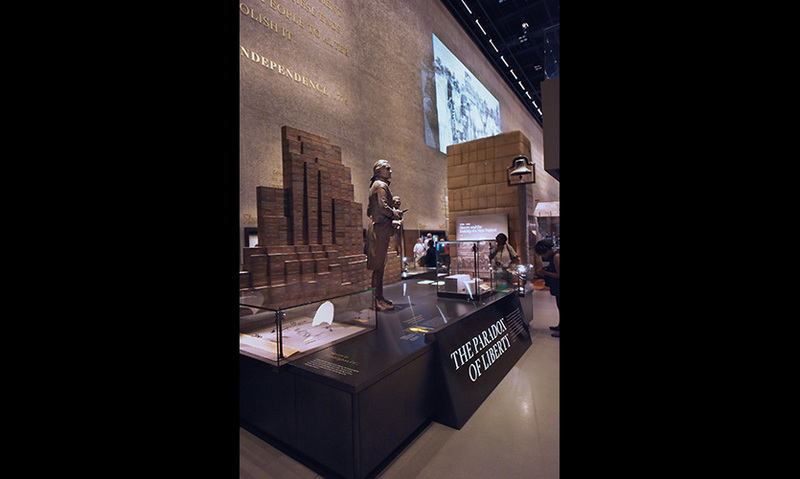 The large space was designed to have an “exterior,” raw materiality, with concrete floors and neutral finishes to allow the artifacts and media to be the visual highlights of the experience, and to support the idea that the Museum wished to tell the “unvarnished truth” of history. This design created a visitor experience in which people could journey “up the mountain”, pause and reflect, as well as see where they are headed while traversing over 45,000 square feet of exhibitions. The Ralph Appelbaum Associates exhibition design team’s ability to impact the design of the architecture while the architectural team was still in a schematic design phase allowed them to propose excavating 60’ deep for the History Galleries to create a large, singular volume so that three galleries could become one, continuous story and journey, within which they could create a more dramatic visitor experience. 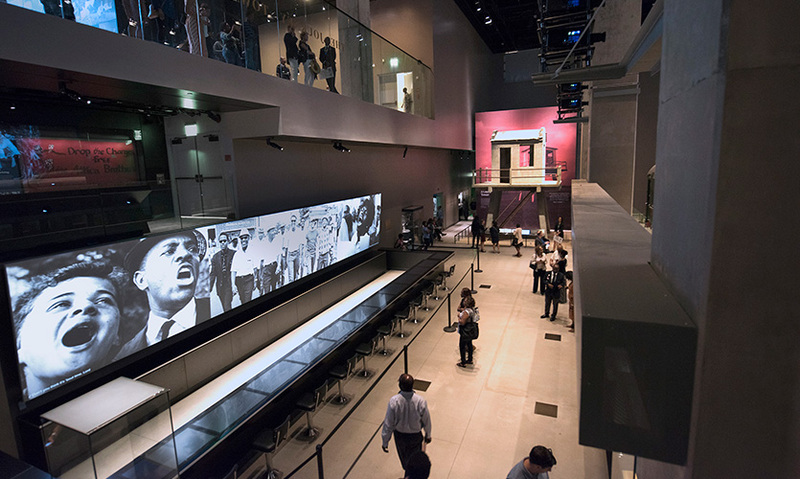 Three “History” galleries: Slavery and Freedom, the Era of Segregation, and Beyond 1968 are tiered within a single monumental space rather than being presented in three separate, conventional gallery spaces as they were originally designed by the architects. The team faced multiple challenges including: base building schedule delays that impacted exhibition design; “wish list” artifacts that came very late in the design process; and script delays and changes that affected exhibit graphic designs. However, they met each of the challenges by applying a force of personal commitment and design excellence to the project. The goal was to create a transformative experience and the design team feels this has been achieved by witnessing first hand reactions by visitors as they walk through and absorb the exhibitions. The overall response to the Museum has been enormous and visitation numbers have exceeded projections by a significant factor, having reached over 30,000 visitors per day and topping 1 million visitors in the little over four months since it opened. In addition to increased numbers of visitors, people are being engaged much longer (3-4 times) than the average 2 hours, for durations of 6-8 hours. "The exhibition, or rather multiple exhibitions, is an incredible display of an overwhelming amount of artifacts from several hundred years back to current times. Each exhibition respects in layout and choice of media the time and circumstances of each period. This is an important exhibition for America and the world, incorporated into an equally breathtaking architectural masterpiece." 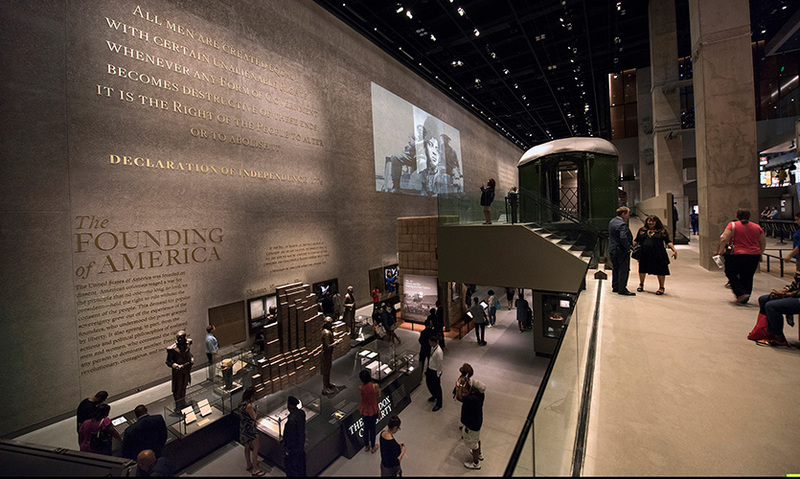 "From the striking projections on the unique facade through the interiors brimming with artifacts and installation, the NMAAHC explains the profound history of African Americans in America. The museum's tightly organized collection of artifacts and media installations pull together a painful history, culture, and innovation." Design and Production Incorporated (prime exhibit fabricator and A/V integration), Hadley Exhibits (exhibit fabricators), Pacific Studios (exhibit fabricators), Smithsonian Channel (executive media producer).